Wall Street couldn't turn it around Tuesday. U.S. stocks fell, with the Dow snapping a streak of 20 winning Tuesdays, on concerns about the global economy. The Dow fell 76 points to end the day 0.5% lower. The index was down more than 130 points earlier, but it recovered some ground in the final hour of trading. 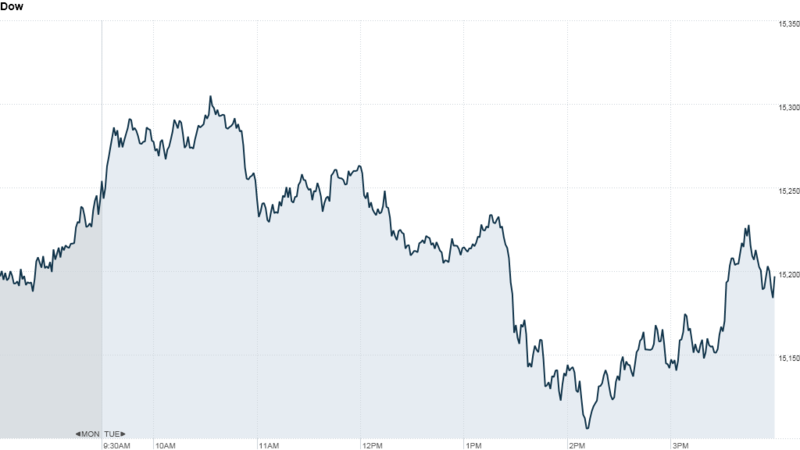 The S&P 500 fell 0.5% and the Nasdaq lost 0.6%. The losses bring to an end a record run of 20 winning Tuesdays for the Dow. Tuesday's retreat was led by shares of companies in the energy and industrial sector, which had been among the better performers recently. Investors had been boosting their exposure to those companies, which stand to benefit from a rebound in economic activity. But a report on the U.S. trade deficit Tuesday highlighted concerns about weakness in global economic activity putting a damper on U.S. economic growth. Frank Davis, director of sales and trading at LEK Securities, said a pullback was not surprising given the rally stocks have had. The major indexes are all up about 16% so far this year. Davis said the declines don't signal a major shift in investor sentiment. "Generally speaking, everyone still believes our market is sound," he said. Fed heads: Stocks have been volatile recently, as investors grapple with an uncertain outlook for Federal Reserve policy. The Fed has said it could increase or decrease the pace of its bond buying program later this year, depending on how the economy performs. Kansas City Fed president Esther George on Tuesday reiterated her call for the Fed to cut back on its bond buying. Yet stocks rallied Monday after comments from Atlanta Fed president Dennis Lockhart raised hopes the central bank would continue to support the economy. The Fed's policies have been an important driver of the bull market over the past few years. But some investors argue that the economy has become strong enough to support stocks even after the Fed makes its exit. "People have been saying this is a Fed-fueled rally," said Joe Bell, senior equity analyst at Schaeffer's Investment Research. "But the focus now seems to be shifting to the economic data." Investors are looking ahead to Friday's jobs report, which could provide insight about the health of the economy for the Fed. Market movers: Salesforce.com (CRM) shares fell after the company signed a deal to acquire cloud marketing platform ExactTarget (ET) for $2.5 billion. Shares of ExactTarget surged 52%. General Motors (GM) shares rose following news that the automaker will rejoin the S&P 500, replacing H.J. Heinz (HNZ) at the end of trading Thursday. Zynga (ZNGA) shares ended higher, following a 12% plunge on Monday, after the online game maker said it would cut more than 500 jobs, or nearly 20% of its staff. Lululemon (LULU) is bringing back its black luon yoga pants after making changes in the material to solve a problem that made them see-through. 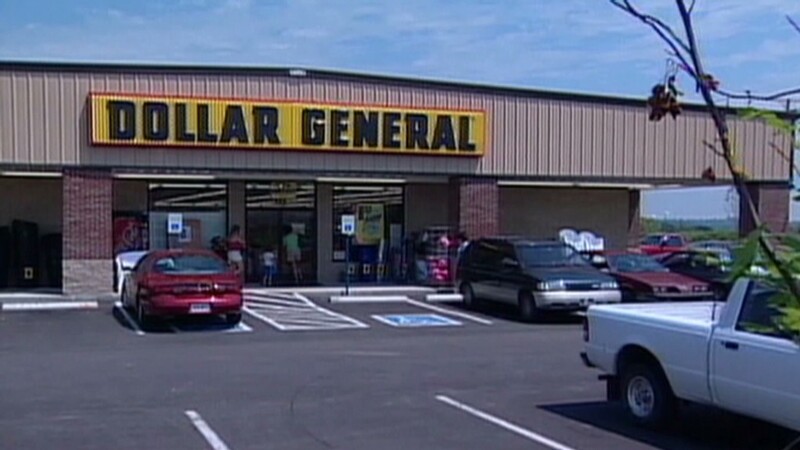 Dollar General (DG) reported earnings and sales in line with forecasts but lowered its guidance. The news weighed on shares of other discount retailers, including Family Dollar (FDO) and Dollar Tree (DLTR). Overseas markets bounce back: European markets closed higher, rebounding from a weak Monday session. In Turkey, the country's benchmark index rallied by as much as 4.5% after markets took a steep drop Monday in reaction to unrest and anti-government protests across the nation. Asian markets ended the day with mixed results. Japan's Nikkei closed with a 2.1% gain, helped by a weakening yen and speculation that government officials will soon urge pension funds to increase their equity holdings. Meanwhile, Hong Kong's Hang Seng was flat at the close and the Shanghai Composite Index declined by 1.2%. In Australia, Billabong (BLLAF) shares took a dive after the surfwear company announced an end to takeover talks and warned of lower profits.